Iron (chemical symbol Fe, from the Latin word ferrum, atomic number 26) is the second most abundant metal (after aluminum) in the Earth's crust and the most abundant element (in terms of mass) in the Earth as a whole. Its predominance in the Earth's core helps produce our planet's magnetic field, which in turn shields the Earth's surface by deflecting charged particles coming from the solar wind. Iron and nickel are notable for being the final elements produced by nuclear fusion reactions within stars—processes that are collectively known as stellar nucleosynthesis. Scientists think that iron (and other elements) on Earth were once part of the material ejected by a supernova (exploding star). Iron is a necessary trace element for all known forms of life. Iron-containing enzymes help transport various soluble gases (including oxygen and carbon dioxide) and catalyze oxidation reactions in living organisms. In addition, given its high abundance, low cost, and high strength, iron is the most widely used of all metals and constitutes about 95 percent of the tonnage of all metals produced worldwide. Its alloys, particularly steels, are used to make large, strong structures such as buildings, automobiles, and the hulls of ships. Iron is also used for making magnets, and iron(III) oxide in particular is used for the manufacture of magnetic storage media for computers. Iron and its alloys, however, tend to rust and need to be protected by such methods as painting, galvanization, or the application of plastic coatings. Iron is one of the most common elements on Earth, making up about 5 percent of the Earth's crust. Most of this iron is found in various iron oxides, such as the minerals hematite, magnetite, and taconite. The Earth's core is believed to consist largely of a metallic iron-nickel alloy. Likewise, about 5 percent of meteorites consist of an iron-nickel alloy. The red appearance of this water is due to iron in the rocks. The first signs of use of iron come from artifacts of the Sumerians and Egyptians dated to around 4000 B.C.E. It appears that they fashioned a few items—such as the tips of spears, daggers, and ornaments—from iron recovered from meteorites. Because meteorites fall from the sky, some linguists have conjectured that the English word iron (Old English īsern), which has cognates in many northern and western European languages, derives from the Etruscan aisar, which means "the gods". Even if this is not the case, the word is likely a loan into pre-Proto-Germanic from Celtic or Italic forms. Some have linked the iron in meteorites to a verse in the Quran (57:25) that says, "… and We sent down iron in which is incredible strength and many benefits for mankind." Some in ancient Greece considered the Halybes to be "the inventors of iron." The people of the Caucasian Isthmus, Khaldi people (or Khalib/Halyb and Halisones by Strabo) were one of the oldest west-Georgian tribes (4000 to 2000 B.C.E.). The word "Halybes" may refer to people in Anatolia or in the Caucasus, and it is also possible that by the time the Greeks knew of iron, it was associated with Chaldea, where it was produced in large quantities (though not invented there). By 2500 B.C.E. to 2000 B.C.E., increasing numbers of smelted iron objects (distinguishable from meteoric iron by the lack of nickel in the product) appear in Mesopotamia, Anatolia, and Egypt. However, their use appears to have been ceremonial, and iron was an expensive metal. In the Iliad, weaponry is mostly bronze, but iron ingots are used for trade. Some resources (see the reference What Caused the Iron Age? below) suggest that iron was then being generated as a byproduct of copper refining, as sponge iron, and was not reducible by the metallurgy of the time. By 1600 B.C.E. to 1200 B.C.E., iron was used increasingly in the Middle East, but did not supplant the dominant use of bronze. 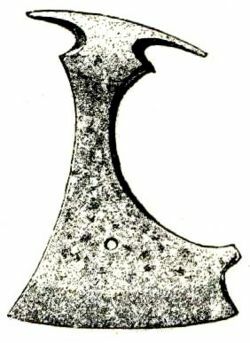 Axe of iron from Swedish Iron Age, found at Gotland, Sweden. In the period from the twelfth to tenth century B.C.E., there was a rapid transition in the Middle East from bronze to iron tools and weapons. The critical factor in this transition does not appear to be the sudden onset of a superior iron working technology, but disruption of the supply of tin. This period of transition, which occurred at different times in different parts of the world, is the ushering in of an age of civilization called the "Iron Age." Classical authors ascribe the first invention of ironsmithing to peoples of the Caucasus and eastern Anatolia, such as the Khaldi (Chaldei) and the Khalib (Chalybes). If local customs regarding the importation of other metal-working techniques prevailed in the case of iron, then it would have been customary for people from the ironworking region (in this case, in Anatolia—since there are many agreements on that source) to establish self-named ethnic enclaves or new towns near the places where they wished to market their goods. Fierce defense of trade secrets had already made this the typical plan, whether with pottery, copper-working, jewelry-making or bronze-making. The inventors moved closer to the markets, but kept themselves distinct and protected their secrets carefully. It is possible that other people came to these new metalworking towns to learn trade secrets, but probably had to pay a price of some kind. The common alchemical symbol for iron, the metal of weapons, is that of Mars, the Roman god of war. Concurrent with the transition from bronze to iron was the discovery of carburization, which was the process of adding carbon to the irons of the time. Iron was recovered as sponge iron, a mix of iron and slag with some carbon and/or carbide. This sponge iron was then repeatedly hammered and folded over to free the mass of slag and oxidize out carbon content, thus producing wrought iron. Wrought iron was very low in carbon content and was not easily hardened by quenching. The people of the Middle East found that a much harder product could be created by the long-term heating of a wrought iron object in a bed of charcoal, which was then quenched in water or oil. The resulting product, which had a surface of steel, was harder and less brittle than the bronze it began to replace. In China, the first irons used were also meteoric iron, with archaeological evidence for items made of wrought iron appearing in the northwest, near Xinjiang, in the eighth century B.C.E. These items were made of wrought iron, created by the same processes used in the Middle East and Europe, and were thought to be imported by non-Chinese people. In the later years of the Zhou Dynasty (about 550 B.C.E. ), a new iron manufacturing capability began because of a highly developed kiln technology. Producing blast furnaces capable of temperatures exceeding 1300 K, the Chinese developed the manufacture of cast iron or pig iron. Iron was used in India at least as early as 250 B.C.E. The famous iron pillar at the Qutb complex in Delhi is made of very pure (98 percent) iron and has not rusted or eroded till this day. 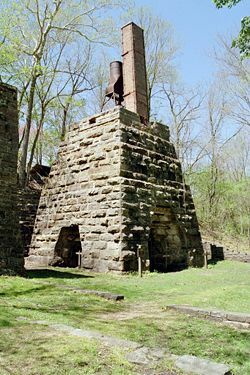 This blast furnace in eastern Missouri consumed up to 11,000 tons of ore and 16,000 cords (58,000 cubic meters (m³)) of wood annually from 1827 to 1891. If iron ores are heated with carbon to 1420–1470 K, a molten liquid is formed, an alloy of about 96.5 percent iron and 3.5 percent carbon. This product is strong, can be cast into intricate shapes, but is too brittle to be worked, unless the product is decarburized to remove most of the carbon. The vast majority of Chinese iron manufacture, from the Zhou dynasty onward, was of cast iron. Yet, iron remained a pedestrian product, used by farmers for hundreds of years, and did not really affect the China's nobility until the Qin dynasty (around 221 B.C.E.). Cast iron development lagged in Europe, as the smelters could achieve temperatures of only about 1000 °C. Perhaps they did not want hotter temperatures, as they were seeking to produce blooms as a precursor of wrought iron, not cast iron. Through a good portion of the Middle Ages, in Western Europe, iron was thus still being made by the working of iron blooms into wrought iron. Some of the earliest casting of iron in Europe occurred in Sweden, at two sites, Lapphyttan and Vinarhyttan, between 1150 and 1350 C.E. Cast iron was then made into wrought iron by the osmond process. Some scholars have speculated that the practice followed the Mongols across Russia to these sites, but there is no clear proof of this hypothesis. In any event, by the late fourteenth century, a market for cast iron goods began to form, as a demand developed for cast iron cannonballs. Early iron smelting used charcoal, as both the heat source and reducing agent. In eighteenth century England, wood supplies became inadequate to enable the industry to expand and coke, a fossil fuel, began to be used as an alternative. This innovation is associated with Abraham Darby at Coalbrookdale in 1709, but it was only later in the century that economically viable means of converting pig iron to bar iron were devised. The most successful such process was Henry Cort's puddling process, patented in 1784. Those processes permitted great expansion in the production of iron, constituting the Industrial Revolution for that industry. How iron was extracted in the nineteenth century. Iron production constitutes about 95 percent of the tonnage of all metals produced worldwide. Industrially, it is produced starting from iron ores, principally hematite (nominally Fe2O3) and magnetite (Fe3O4) by reducing the ore with carbon in a blast furnace at temperatures of about 2,000 °C. Iron ore, carbon (in the form of coke), and a flux such as limestone are fed into the top of the furnace, while a blast of heated air is forced into the furnace from the bottom. The slag melts in the heat of the furnace, at a temperature at which silicon dioxide would not have melted. In the bottom of the furnace, the molten slag floats on top of the denser molten iron, and spouts in the side of the furnace may be opened to drain off either the iron or the slag. The iron, once cooled, is called pig iron. The slag can be used in road construction or to improve mineral-poor soils for agriculture. Pig iron is later reduced to steel, using convertors. Iron ore is produced in 48 countries, of which the five largest producers are China, Brazil, Australia, Russia, and India, accounting for 70 percent of world iron ore production. Approximately 1,100 Mt (million tons) of iron ore was produced in the world in 2000, with a gross market value of approximately 25 billion US dollars. This iron ore was used to produce approximately 572 Mt of pig iron. Iron is a ductile, malleable, gray-colored metal and is a good conductor of heat and electricity. It is attracted by magnets and can be readily magnetized. In chemical terms, it is classified as a transition metal. It is located in period 4 of the periodic table, situated between manganese and cobalt. In addition, it lies at the top of group 8 (former group 8B). Iron, cobalt, and nickel have a number of similar properties and were once grouped together as group 8B. Iron is believed to be the tenth most abundant chemical element in the universe. Making up about 5 percent of the Earth's crust, it is second in abundance to aluminum among metals and fourth in abundance among the elements. In addition, it makes up about 32 percent of the mass of the Earth as a whole, thus being the most abundant element (by mass) on the planet. The concentration of iron in the various layers of the Earth ranges from very high at the inner core to only a few percent in the outer crust. The universally most abundant of the highly stable nuclides is 56Fe. It is formed by nuclear fusion reactions in stars. In addition, when a very large star contracts at the end of its life, internal pressure and temperature rise, allowing the star to produce progressively heavier elements, although these are less stable than the elements around mass number 60, known as the "iron group." This process leads to a supernova. Naturally occurring iron consists of four isotopes: 5.85 percent of slightly radioactive 54Fe (half-life >3.1×1022 years), 91.75 percent of stable 56Fe, 2.12 percent of stable 57Fe, and 0.28 percent of stable 58Fe. In addition, it appears that the naturally occurring radioactive isotope 60Fe, with a half-life of 1.5 million years, is now extinct, but it can be produced synthetically. Much of the past work on measuring the isotopic composition of iron centered on determining 60Fe variations due to processes accompanying nucleosynthesis (that is, through meteorite studies) and ore formation. The isotope 56Fe is of particular interest to nuclear scientists. A common misconception is that this isotope represents the most stable nucleus possible, and that it would be impossible to perform fission or fusion on 56Fe and still liberate energy. This is not the case, as both 62Ni and 58Fe are more stable. In phases of the meteorites Semarkona and Chervony Kut, a correlation between the concentration of 60Ni, the daughter product of 60Fe, and the abundance of the stable iron isotopes could be found, suggesting the existence of 60Fe at the time of formation of the solar system. The abundance of 60Ni present in extraterrestrial material may provide further insights into the origin and early history of the Solar System. Iron(II) oxide or ferrous oxide (FeO): This black-colored powder needs to be handled with care as it readily ignites and can cause explosions. It has a mineral form known as wüstite. It is an example of a non-stoichiometric compound, as the ratio of iron and oxygen atoms can vary due to vacancies in the crystal structure. It is a pigment and is used in some tattoo inks. It has been approved by the U.S. Food and Drug Administration (FDA) for use in cosmetics. Iron(III) oxide:, ferric oxide, or red iron oxide (Fe2O3): This compound corresponds to iron rust. Its mineral form, known as hematite, is mined as the main ore of iron and is used in the production of iron in a blast furnace. It has ferromagnetic properties and is therefore useful for magnetic storage media in computers. A fine powder of ferric oxide is known as "jeweler's rouge," "red rouge," or simply "rouge". It is used to put the final polish on metallic jewelry and lenses. It is also a pigment in products known as "Pigment Red 101" and "Pigment Brown 6," which have been approved by the FDA for use in cosmetics. Iron (II, III) oxide or ferrous ferric oxide (Fe3O4): This oxide is found in nature as the black-colored mineral magnetite or lodestone, and it is a major ore of iron. It is also seen on Mars. This oxide of iron tends to occur when iron corrodes underwater, and so is often found inside tanks or below the waterline of ships. Iron(III) oxide-hydroxide, hydrated iron oxide, or yellow iron oxide (FeO(OH)): This solid material (in anhydrous or hydrated forms) has colors ranging from yellow through dark brown to black. It occurs naturally as minerals goethite, siderogel, feroxyhyte, limonite, and lepidocrocite. It is used in aquarium water treatment as a phosphate binder. The FDA has approved its use, in the form of "Pigment Yellow 42," in cosmetics and some tattoo inks. Iron(III) chloride or ferric chloride (FeCl3): This crystalline compound appears dark green by reflected light, but purple-red by transmitted light. It is acidic, toxic, and highly corrosive. It absorbs moisture from the air, producing fumes of hydrochloric acid (HCl). When dissolved in water, it undergoes hydrolysis and gives off a great deal of heat. The resulting brown, acidic solution, which is corrosive, is used as a coagulant in treating sewage and drinking water and as an etchant for copper-based metals (such as those found in printed circuit boards) and stainless steel. It is used (in the anhydrous form) as a catalyst for certain organic synthetic reactions. Iron(II) sulfate or ferrous sulfate (FeSO4): This ionic compound can be found in various states of hydration (that is, a varying number of water molecules can be attached to each molecule of ferrous sulfate). The heptahydrate (FeSO4·7H2O) is also called green vitriol or copperas. It is used in the manufacture of inks, in wool dyeing as a mordant (agent that sets the dye), and in water purification as a substitute for aluminum sulfate. In horticulture, it is used as a lawn conditioner and moss killer. It is also an additive found in various foods, and it is used to treat iron-deficiency anemia. Of all metals, iron makes up the highest level of production and usage. Its combination of low cost and high strength makes it indispensable, especially for applications such as automobiles, hulls of large ships, and structural components for buildings. Some of the various alloys of iron and their applications are given below. Pig iron: It has a carbon content of 4–5%, and varying amounts of contaminants such as sulfur, silicon, and phosphorus. Its only significance is that it forms an intermediate in the steps leading from iron ore to cast iron and steel. Cast iron: It contains 2–4.0 percent carbon, 1–6 percent silicon, and small amounts of manganese. Contaminants present in pig iron (such as sulfur and phosphorus) that negatively affect the material properties have been reduced to an acceptable level. Cast iron has a melting point in the range of 1420–1470 K, which is lower than that of either of its two main components. Consequently, it is the first product to be melted when carbon and iron are heated together. Its mechanical properties vary greatly, depending on the form of carbon in the alloy. For instance, "white" cast irons contain carbon in the form of cementite, or iron carbide. This hard, brittle compound dominates the mechanical properties of the white cast irons, rendering them hard but unresistant to shock. The broken surface of a white cast iron is full of fine facets of the broken carbide—a pale, silvery, shiny material, hence the appellation. In gray iron, the carbon exists free as fine flakes of graphite, and also renders the material brittle due to the stress-raising nature of the sharp-edged flakes of graphite. A newer variant of gray iron, referred to as ductile iron, is specially treated with trace amounts of magnesium to alter the shape of graphite to sheroids (or nodules), vastly increasing the material's toughness and strength. Carbon steel: It contains 0.4–1.5 percent carbon, with small amounts of manganese, sulfur, phosphorus, and silicon. Wrought iron: It contains less than 0.2 percent carbon and is a tough, malleable product, not as fusible as pig iron. If honed to an edge, it loses it quickly. Wrought iron is characterized, especially in old samples, by the presence of fine "stringers" (or filaments) of slag entrapped in the metal. Wrought iron resists rusting when used outdoors. It has, however, largely been replaced by mild steel for "wrought iron" gates and blacksmithing. Mild steel does not have the same corrosion resistance but is cheaper and more widely available. Alloy steels: They contain varying amounts of carbon and different metals such as chromium, vanadium, molybdenum, nickel, and tungsten. They are used for structural purposes, as their alloy content raises their cost and necessitates justification of their use. Recent developments in ferrous metallurgy have produced a growing range of microalloyed steels, also termed "HSLA" (high-strength, low-alloy) steels, containing tiny additions to produce high strengths and often spectacular toughness at minimal cost. The main drawback in using iron and its alloys is that they suffer from rust if not protected in some way. Painting, galvanization, plastic coating, and bluing are some techniques used to protect iron from rust by excluding water and oxygen, or by sacrificial protection. The use of iron metal filings in organic syntheses is mainly for the reduction of nitro compounds. Additionally, iron has been used for desulfurization reactions, reduction of aldehydes, and the deoxygenation of amine oxides. Iron is an essential element for all known organisms. In most cases, it is stably incorporated within proteins that belong to the class known as metalloproteins. By contrast, in the exposed ("free" form), it causes production of free radicals that are generally toxic to cells. To say that iron is free does not mean that it is free floating in bodily fluids. It binds avidly to virtually all biomolecules, so it will adhere nonspecifically to cell membranes, nucleic acids, proteins, and so forth. 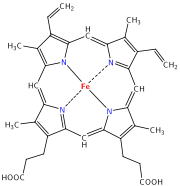 In many animal species, iron (in the form of the ferrous ion, Fe2+) is present in the heme complex, an essential component of proteins such as hemoglobin (involved in carrying oxygen) and cytochromes (involved in cellular respiration and other processes). Inorganic iron involved in redox reactions is also found in the iron-sulfur clusters of many enzymes, such as nitrogenase (involved in the synthesis of ammonia from nitrogen and hydrogen) and hydrogenase. In addition, a number of non-heme iron proteins are enzymes that are responsible for a wide range of functions in several life forms. When the body is fighting a bacterial infection, the body sequesters iron inside of cells (mostly in the storage molecule ferritin), so that it cannot be used by bacteria. Iron distribution is heavily regulated in mammals, both as a defense against bacterial infection and because of the potential biological toxicity of iron (noted below). The iron absorbed from the duodenum binds to transferrin and is carried by blood to different cells. There it gets incorporated into target proteins..
Good sources of dietary iron include meat, fish, poultry, lentils, beans, leaf vegetables, tofu, chickpeas, black-eyed peas, strawberries, and farina. Iron provided by dietary supplements is often found as iron(II) fumarate. Iron sulfate is as well absorbed, and less expensive. The most bioavailable form of iron supplement (ten to fifteen times more bioavailable than any other) is iron amino acid chelate. The Recommended Dietary Allowance (RDA) for iron varies considerably based on the age, gender, and source of dietary iron (heme-based iron has higher bioavailability). Excessive iron is toxic to humans because excess ferrous iron reacts with peroxides in the body, producing free radicals. Iron becomes toxic when it exceeds the amount of transferrin present to bind free iron. In excess, uncontrollable quantities of free radicals are produced. Iron uptake is tightly regulated by the human body, which has no physiologic means of excreting iron and regulates iron solely by regulating uptake. Too much ingested iron can damage the cells of the gastrointestinal tract directly and may enter the bloodstream by damaging the cells that would otherwise regulate its entry. Once in the bloodstream, it can damage the cells of organs such as the heart and liver. This could potentially lead to long-term organ damage and even death from overdose. Humans experience iron toxicity above 20 milligrams (mg) of iron for every kilogram (kg) of weight, and 60 mg/kg is a lethal dose. Over-consumption of iron, often the result of children consuming large quantities of ferrous sulfate tablets intended for adults, is the most common toxicological cause of death in children under six. The Dietary Reference Intake (DRI) lists the Tolerable Upper Intake Level (UL) for adults as 45 mg/day. For children under fourteen years old, the UL is 40 mg/day. If iron intake is excessive, it may lead to iron overload disorders such as hemochromatosis. Iron overload disorders are based on a genetic inability to regulate iron uptake. Many people have a genetic susceptibility to iron overload without realizing it and without knowing a family history of the problem. For this reason, people should not take iron supplements unless they suffer from iron deficiency and have consulted a doctor. Blood donors are at special risk of low iron levels and are often advised to supplement their iron intake. The medical management of iron toxicity is complex. One element of the medical approach is a specific agent called deferoxamine, used to bind and expel excess iron from the body in case of iron toxicity. The word "iron" is used metaphorically as an adjective, to describe certain iron-like traits, including sturdy, strong, stern, harsh, unyielding, inflexible, rigid, or robust. We are now familiar with many materials that are stronger and sturdier than iron, such as diamond or steel. Still, the "iron" metaphor persists among many cultures, apparently rooted in the Iron Age, when iron defeated bronze. ↑ Rick McCallister and Silvia McCallister-Castillo, A-AL Etruscan Glossary (1999). Retrieved October 22, 2011. ↑ Krahe Indogermanische Forschungen 46:184f. compares Old Irish, Illyrian, Venetic, and Messapic forms. ↑ Abram and Lot may have been two such, coming to the new place, Ur of the Chaldees, which was a new Ur, not the old Ur, designed for metal production. ↑ Other polishing compounds are also often called "rouge," even when they do not contain iron oxide. ↑ B. A. Fox, T. L. Threlfall, Organic Syntheses Coll. 5 (1973): 346; 44 (1964): 34. Article. Retrieved October 22, 2011. ↑ A. T. Blomquist, and L. I. Dinguid, J. Org. Chem. 12 (1947): 718 & 723. ↑ H. T. Clarke and E. Dreger, Organic Syntheses Coll. 1 (1941): 304; 6 (1926): 52. Article Retrieved October 22, 2011. ↑ J. den Hertog, and J. Overhoff, Recl. Trav. Chim. Pays-Bas 69 (1950): 468. ↑ Non-heme iron proteins include enzymes such as methane monooxygenase (oxidizes methane to methanol), ribonucleotide reductase (reduces ribose to deoxyribose; DNA biosynthesis), hemerythrins (oxygen transport and fixation in marine invertebrates), and purple acid phosphatase (hydrolysis of phosphate esters). ↑ Tracey A. Rouault, "How Mammals Acquire and Distribute Iron Needed for Oxygen-Based Metabolism." Public Library of Science; Biology, December 22, 2003. Retrieved October 22, 2011. ↑ H. DeWayne Ashmead, Conversations on Chelation and Mineral Nutrition (Keats Publishing, 1989, ISBN 087983501X). ↑ Institute of Medicine Dietary Reference Intakes: Elements. Retrieved March 10, 2008. ↑ Toxicity, Iron. Emedicine. Retrieved October 22, 2011. Greenwood, Norman N., and A. Earnshaw. Chemistry of the Elements, 2nd Edition. Burlington, MA: Butterworth-Heinemann, Elsevier Science, 1998. ISBN 0750633654. Online version. Retrieved October 22, 2011. Schubert, H.R. History of the British Iron and Steel Industry … to 1775 C.E. London: Routledge, 1957. This page was last modified on 6 March 2018, at 00:43.